> Tips for the day of your party! Q. How long is the presentation? A. The presentation is about 60 minutes long. This includes all of our awesome experiments, demonstrations, customizations and the take-home experiment activity! Q. Is the party interactive? A. 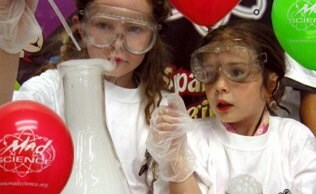 Our parties are a mix of exciting science demonstrations and experiments. Our scientist will use volunteers for some of the experiments and some are hands-on for all the party guests. Each party culminates with an awesome take-home chemistry activity that every child will perform! Q. How far in advance should I book the party? A. We recommend booking 4 weeks in advance to get the time and day you are looking for. Q. Where do you hold your parties? A. We come to your location. Most people do the party at their home; others will rent a space at a community center or YMCA. If you look to our menu on the left you can also see a few of our favorite spots to do Mad Science parties. Q. When will the Mad Scientist arrive? When should the guests arrive? A. The Mad Scientist will arrive 15 minutes before the start of the presentation to set up. We recommend having your guests arrive 15-30 minutes before the scientist will start, to ensure that everyone is there for the presentation. Q: Should I tip the Mad Scientist? A: Often customers inquire about a gratuity for the instructor. At your discretion, the typical service percentage (15% - 20%) is customary. Please pay your Mad Scientist directly and do not include this amount in the balance due. Q. What do I need to have available for the Mad Scientist? A. Our scientist will need a room that can be dimmed or darkened, with a buffet-style table (approximately 6-8 feet long) and enough floor space for the children to sit and watch during the presentation. Size of the room depends on the number of party guests. The scientist will also need access to water and electricity. Q. Why should I be able to darken or dim the room? A. All of our experiments are really cool, but some of our experiments are far more exciting if we can dim or darken the room! It heightens the overall effectiveness of the experiments. Often people cut black trash bags open and tape them over the windows. After the Mad Scientist is done presenting, the bags are pulled down. It works great! If we must, we can work in a space that can't be darkened as we are masters of improvisation. Q. Is there a deposit to reserve my party? A. Yes, the deposit is $100. This deposit is applied to your balance. The Mad Scientist will arrive with an invoice. The invoice will represent your balance. Mad Science will bill the balance for the party the Monday following your event. Our instructors do not collect cash or checks on site. Q. Is the party messy? A. Our Mad Scientist are very skilled at keeping the experiments safe and contained. If your party includes slime making, you may wish to have the children do this outdoors or in a location such as a kitchen table or on a tile/linoleum floor. Although our parties require indoor space, slime-making can be done outdoors. Even though the polymer is made in a cup, a drop cloth safeguards against an indoor spill. Q: Are adults/parents invited to observe the party? A: Yes! 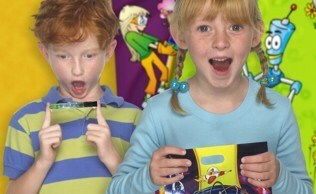 Kids of all ages will enjoy our unique brand of fun, hands-on science. Should adults be present, we ask that they limit their involvement to observation only and that they respect our desire for silence during the entertainment. One of the best parts of Mad Science parties is that kids get to do most of the activities themselves. Any child who participates in the party activities, regardless of age, will be included when we calculate party participants. Q: Can I have alcohol at a party at my location? A: That is entirely up to you. As fun, hands-on science and inebriation usually do not mix very well, we ask that you excuse your drinking guests from the area in which we will perform. Likewise, it is our company policy that no Mad Scientist can drink prior to or during his/her interaction with children. Q: What happens in the case of inclement weather? Will my party be canceled? A: Mad Science does reserve the right to re-schedule programs due to inclement weather to preserve the safety of our staff & participants. We will contact you the day before your party if conditions are such that we cannot safely support your party. Should weather conditions deteriorate during the day of your party, your Mad Scientist will determine if we can support your party and will contact you directly. We realize your child's birthday comes around but once a year. We do everything in our power to ensure we do not disappoint a child on his/her birthday. Should your party be canceled, we will make every effort to reschedule as quickly as possible. Q: How do I get in touch with Mad Science? (888) MADD-SCI. We maintain normal business hours of 9:00 AM – 5:00PM, Monday through Friday. You may also reach us via e-mail at madscience@optonline.net. We do not give out contact numbers for our Mad Scientists. We look forward to being invited to your party! on-line Party Request Form here. 1) Our Mad Scientist will come to wherever you are holding the party! 2) We conduct birthday parties on any day of the week and at any time; however Saturday and Sunday are the most popular days. Therefore it is recommended that you book your party at least one month in advance. We may be able to accommodate your request with less lead time, but it will be difficult. Also consider a Friday evening party. These are becoming increasingly popular. 3) Although our traditional party packages are meant for up to 20 guests we can accommodate any size group or budget. Call for details should your event not meet our guidelines. 4) PARTY LOCATION. We have performed the entertainment at birthday parties in a huge variety of locations: family rooms, basements, garages, church social halls, restaurants of all kind, the mall food court, you name it! We can make fun science happen just about anywhere! However some locations work better than others for our unique brand of hands-on science. We require an indoor location with access to power and water. Some aspects of our parties like the take home project can be done outside, but it is best to plan to be inside for the duration of the party. The ability to darken the area may enhance some of our demonstrations. We prefer to keep away from skylights and large bay windows. If your location has lots of light, please inform our staff when booking your party so we can make the necessary adjustments. A location dedicated to just your party will be the best for your enjoyment. As our shows are highly interactive and rely on numerous volunteers, we prefer a location where the kids can sit on the floor with room to move around and get up and down. 5) All of our birthday parties last approximately 60 minutes depending on the size of your party and the ages of the children. During this time, we will perform between 6 and 10 hands-on activities and demonstrations and make a take-home project for all the kids! 6) Our parties involve hands-on, interactive activities, and are appropriate for children 5 and older. Younger siblings are welcome to watch but generally do not participate that much. Regardless of age, anyone participating in the activities and making the take-home project will be considered when determining the number of participants and your cost. 7) It is best to book as soon as possible as our weekend party slots sell out quickly. When ready to book, just call our office and ask for our birthday party specialist. If it is outside of normal office hours, you can take advantage of our Party Request Form. Please note: when using this form your party will not be confirmed until Mad Science is in receipt of a deposit AND has provided you with a Mad Science Party Confirmation Form. 8) A $100 non-refundable deposit is required at the time of booking and must be taken via Visa or Mastercard. Your party time and date will not be reserved until this deposit is paid. Mad Science will bill the balance for the party the Monday following your event. Our instructors do not collect cash or checks on site. 9) At the time of booking, we will send out a letter that confirms your party reservation. If we have not heard from you sooner, we will call you about 5 days in advance to re-confirm your information. 10) Your Mad Scientist will call and introduce him/herself, verify all information and obtain directions to your party site approximately 48 hours before your event. 11) Often customers inquire about a gratuity for the instructor. At your discretion, the typical service percentage (15% - 20%) is customary. Please pay him or her directly as this amount will not be processed with the balance due. THE EASIEST PARTY EVER! There are no hassles, no worries and no mess for you as our Mad Scientist will arrive about 15 minutes early to set-up, will conduct the show and then will clean up leaving the party site exactly as he/she found it. WHAT WE NEED: What Mad Science will need from you: access to electricity and water, and a buffet-style table (approximately 6-8 feet long) for our equipment. An area where the kids can sit on the floor with enough room to get up and down is preferred. The ability to darken the area in which the presentation will take place may enhance some of our experiments. PARTY LOCATION: We have performed the entertainment at birthday parties in a huge variety of locations: family rooms, basements, garages, church social halls, restaurants of all kind, the mall food court, you name it! We can make fun science happen just about anywhere! However some locations work better than others for our unique brand of hands-on science. QUIET IN THE LAB: The party is best presented in a quiet room with few distractions. We ask that you discourage toys, balloons and the serving of food while the instructor performs. If parents or adults stay and chat we would ask that they congregate somewhere other than where the Mad Science is being performed. NAME TAGS: With your confirmation letter you will receive a sheet of adhesive name tags. Please provide the guests these name tag stickers with their names filled out. It will enhance our instructor’s rapport with the kids and at the end of the party can be transferred to the lids of their take home experiments. ARRIVAL TIME: The Mad Scientist will arrive at your location approximately 15 minutes before the Mad Science Show Start Time. We ask that you separate the Mad Scientist from the children while they prepare the equipment so the entertainment can start on time. To accommodate for any late arrivals and ensure your entertainment starts on time, we recommend that you tell your guests to arrive at least 15 minutes prior to the Mad Science Show Start Time. PARTY TIME: The Mad Scientist will be ready to begin your party entertainment at the stated Mad Science Show Start Time. Should all your guests not be present at the stated party start time, the host may elect to delay the start of the party entertainment. If the party entertainment starts late, we may not be able to make up the missed time as the Mad Scientist may have another party to perform after yours. PARTY LENGTH: The entertainment portion of all our birthday parties lasts approximately 60 minutes depending on the size of your party and the ages of the children. During this time, we will perform between 6 and 10 hands-on activities and demonstrations and make a take-home project for all the kids! PARTY FLOW: The Mad Science entertainment can take place at any time during the course of your party, however we recommend that it be done first and followed by food. The entertainment portion of your party will begin at the start time that we have confirmed. Once our entertainment begins, the Mad Scientist will perform until our entertainment portion is complete. We will not be able to stop and accommodate another party activity like cake or presents so please plan the rest of your party accordingly. NO MESS: Our Mad Scientist are very skilled at keeping the experiments safe and contained. If your party includes slime making, you may wish to have the children do this outdoors or in a location such as a kitchen table or on a tile/linoleum floor. Although our parties require indoor space, slime-making can be done outdoors. Even though the polymer is made in a cup, a drop cloth safeguards against an indoor spill. PAYMENT: The Mad Scientist will present you with an invoice upon completion of your event. This will reflect the Balance Due which should be the Total Party Cost minus any deposit or pre-payments. Mad Science will bill the balance for the party the Monday following your event. Our instructors do not collect cash or checks on site. Please handle any gratuities separately. ADJUSTMENTS TO THE PRICE: As determining the number of party guests is not an exact science, many aspects of your party can be adjusted up to and including the day of your party. For instance, you will be charged for any overages beyond the limit of 20 children, however it is imperative that you are as accurate as possible in your estimated guests as we will pack your equipment based on those numbers. Please address these changes with the Mad Science office in advance or with your Mad Scientist the day of your event. TIPPING: Often customers inquire about a gratuity for the instructor. At your discretion, the typical service percentage (15% - 20%) is customary. Please pay your Mad Scientist directly and do not include this amount in the balance due. YOUR OPINION MATTERS! After your event Mad Science will present you with a survey. Please take a moment, at your leisure, to provide our office with feedback on your experience. It is through these surveys that we ensure your Mad Scientist and your experience meets your expectations. We will also call you after the party to follow-up and make sure all went well.